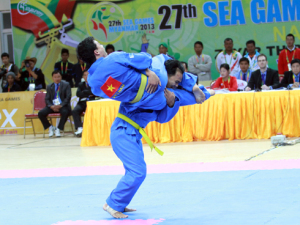 General Secretary of the World Vovinam Federation Vo Danh Hai shared pride when traditional martial arts of the nation are widely promoted as well as the mission of the Vietnam Vovinam at SEA Games 27. – How do you assess the level of Vovinam promote the regional and world? – We have conducted a very lengthy campaign, with the goal of bringing Vovinam to international competition by submitting so many experts, brought many groups performing athletes. The results are already visible in Vovinam three important competitions at the international level is the congress Sports Indoor Asia – Asian Indoor Games – 2009, the Games in 2011 and now the 2013 SEA Games. – Impressions of how when he was brought into the Vovinam content compete in three major tournaments just mentioned? – From a traditional martial arts of the nation, Vovinam has developed into an international sport. We, the participants in the promotion and development of this martial art, Vovinam was very touched when friends and international areas received as a noble sport. Of course, there is still a lot to talk about achievement, about how to promote and position of Vovinam in the eyes of friends is very encouraging. Vovinam is gradually affirmed its position in the international competition. – Compared with taekwondo or karate, Vovinam there are differences in how the process of integration with the international competition? – With the establishment of the World Vovinam Federation in 2008, Vovinam has achieved a very important milestone in the promotion process. But we can hardly compare to the level of investment as taekwondo or karate’s. I took like taekwondo, an Olympic sport. They received huge support from the state, from the largest financial group in South Korea. About how to do, we also learn what other sport, with the attempt to put Vovinam in the competition to ensure goal achievement for Vietnam’s sports, and persuade other nations to join played with noble principles, honesty. We are also building new competition rules which apply when entering I even Vietnam is difficult to gain the monopoly. – The World Federation has supported other nations how to develop Vovinam? – Since 2007, we held several round give training experts to Iran, some Middle Eastern countries, France, Italy, Spain and some African countries. From the initial support, the Vovinam in these countries is growing. Particularly in Southeast Asia, we have sent many top professionals to undercover in Myanmar, Indonesia, Thailand and Laos. To prepare for the SEA Games this time, the host Myanmar sent more than 40 athletes their peak during training to Vietnam earlier this year. Then, we also sent five experts to support the best for you in the organization of this martial art competitions in the SEA Games. Vo Danh Hai Secretary-General (right) in one go promoting Vovinam in Iran. – The mission of the Vietnam Vovinam at SEA Games 27 this time is what sir? – At this year’s congress this subject has 18 categories of competition, including 12 content punch and 6 countervailing content. About punch, Vietnam is unmatched in the region. But Vietnam Vovinam always must reflect the two tasks. First, we must ensure the achievement contribution to Vietnam’s sports delegation. Second, we must promote the introduction of Vovinam for other countries to contribute to long-term strategy to help the art continues to be present in the following competitions. – What specific targets of Vovinam in the SEA Games this year is how many gold medals sir? – We just set a target of 5 to 6 won gold medals.